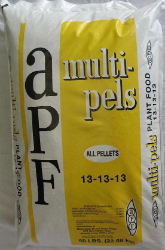 Multi-Pels™ are a free flowing blend of pellets ideal for broadcast slinging or drilling. You get multi-source nitrogen and phosphorus in Multi-Pels™. All nitrogen is in the ammoniacal form. 13-13-13 is made by blending ammonium sulfate, phosphate, and potash.